Article: How welcoming is your company doormat? How welcoming is your company doormat? I think that a lot of people in B2B sales and marketing really don’t appreciate the extent to which Google is the doorway to the internet. I was looking at one company’s web visitor analytics the other day and saw that nearly 90% of all visits to the website had come through Google. That’s nine out of ten prospects and customers. Now, I’m not suggesting that Google has generated all these visits, although the company would like us to think it does. Much of the traffic, if not most of it, will be people who know where they want to be and are just using the search engine to save themselves some keystrokes. You can tell people what your website domain is as much as you like, but few will type ‘w-w-w-dot whatever dot com’ into their browser. 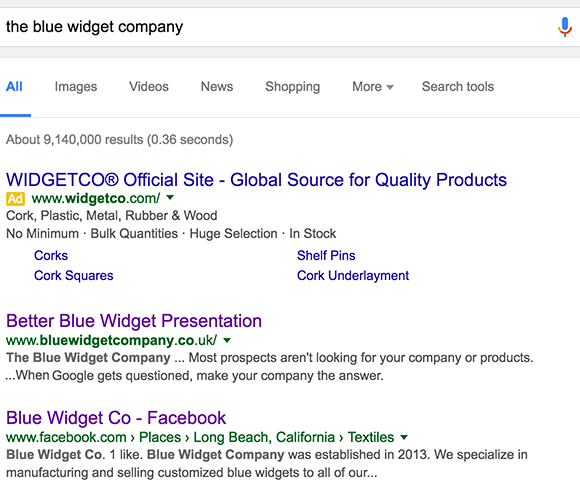 Anyone who wants to find you will just type in your company or product name, be taken to the Google results page, scan for the result they want, and click it. With tens, hundreds or thousands of people each day doing this for your company, the result in Google for a simple search on your name is crucial. What does yours look like? Does it dominate the top of the page? Does it take people to the right website (a problem for many multinationals)? Does it give the right message about who you are and what you do? If it’s not straight to the point, people may start scanning around the page and be distracted by alternatives. And if there’s one thing you don’t want, it’s for people who want to reach your website to get distracted. The lesson to be learned is to regularly check this most crucial of marketing assets, and be prepared to rewrite your entry or to advertise above your own name. It matters. A lot.